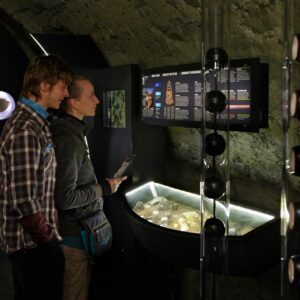 The futuristic interactive exposition is devoted to moldavites and their story. Moldavites are a very special material created by the cosmic energy and are found exclusively in the heart of Europe. We want tho show this world rarity as the part of our natural heritage bound to the South Bohemian region. Maybe you have already heard of moldavites, but in our museum you surely find many new things. What strange origin they are of, why are they so valued, why they are so unique and why they belong to the southern Bohemia. The multilingual exhibition introduce you to the moldavites from many points of view, is easy to understand but provides scientificly accurate information. The movie (in english) is a good introduction to the topic. Then you can explore the exhibition and discover many more interesting things about the outer space, asteroides and cosmic collisions and their impact on the life on the Earth. The renowned J.A.Comenius, teacher and writer, has introduced the idea of “School as a play” in the 17th century. Today this principle is called “edutainment” and the arched interiors of the subterranean level of the medieval house, enabled us to create a really adventurous enviroment. Beside moldavites, you can see meteorites and other “strange” stones here, or visit virtually the most distinctive craters around the globe. You can also go through the cosmic impact step by step or throw your meteorite onto the Earth. The moldavite museum is located in center of Český Krumlov – in the street Panská No. 19 – about 30m from the north corner of Svornost Square.